You are here: Home / Cooperage / It takes a Forest! 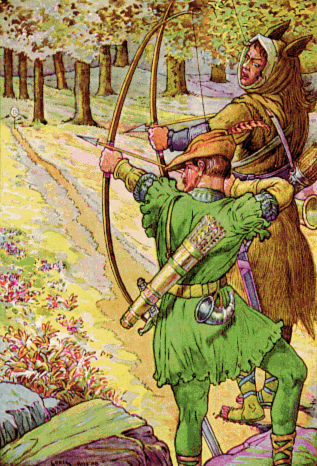 From childhood, our imaginations are repeatedly stirred by captivating tales of noble forest-dwellers the likes of Robin Hood interspersed with fantastical worlds inhabited by gnomes, fairies, trolls, wolves and the like. As we grow, the forest enchants us through the infinite expanse of places it challenges our minds to explore and discover. Whether scaling one last rocky escarpment to reach the summit or stoking a roaring camp fire late into the night we find peace and rejuvenation in this natural place. For the wine lover, nature’s great expanses of woods resonate in a particularly meaningful way. A significant chapter of the illustrious history of wine-making is steeped in the measured harvest and meticulous management of the oak forest, representing one of the most critical components of the process of coaxing vine to wine. In a sense, the relationship of wood to wine recalls that of the costumier to the stage star with well-appointed attire exuding style and grace and ill-conceived creations inviting ridicule and derision. The oak cask, first crafted by the Celts over 2,000 years ago to replace the more cumbersome, age-old earthenware amphora in view of supplying an ever-thirstier Rome, is a critical actor in the production of some of the world’s greatest wines! The cooper or barrel-making artisan craftsman engages in a trade that in its first applications was seen as no more noble than that of the cobbler. The barrel was viewed simply as a containment vessel with no intrinsic qualities beyond this. Slowly, a growing understanding emerged of the nuanced attributes and influence that certain types of wood, sourced from the right forests, when properly seasoned and toasted could impart to a finished wine. From the American white Quercus alba (oak) widely used in Spain and Australia, and historically (though this has changed dramatically in recent years with improved understanding of cooperage) viewed as more aggressive and crude, to the smaller Eastern European, mainly Slovenian and Hungarian varieties used widely in Italy, oak comes in a multiplicity of manifestations. Towering over the industry are the great oak forests of France – Allier, Troncais, Limousin, Nevers and Vosges whose Quercus patraea and Quercus robur varieties are responsible for some of the most coveted staves used in the production of fine wine! French oak is often finer-grained, imparts less of an aromatic footprint yet lends a more tannic structural component in contrast to American oak that is wider-grained, contributes a lower wood tannin influence yet offers more perceptible aromatics to the finished wine. The former has a profound imprint on a significant number of the world’s great reds and whites. The latter has been a dedicated historical partner in the production of the compelling red wines of both Spain’s Rioja district as well as to a host of world-class Shiraz and Cabernet Sauvignon efforts from the wine lands of Australia as examples. The cooper’s methodology involves seasoning (or drying) the staves or planks – with air-drying being preferred for the resulting softer tannins this method achieves. 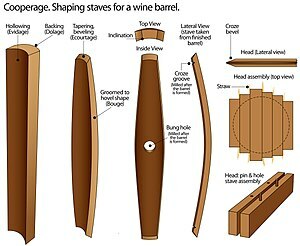 Once seasoned, these staves are top-ringed with metal bands to create the first semblance of a barrel and the pivotal toasting phase begins. Here, a contained fire is ignited in the center of the open-topped cask. Outside of the specimen selection itself, the degree of toast or the amount of time that heat is applied to the inside of the barrel will determine which of a host of flavor characteristics will dominate. Oak extraction occurs in the fermentation and aging process with the wood’s influence becoming attenuated as the barrels move from new to second or third use and beyond. Vanilla is a common oak aromatic with other flavor characteristics such as baking spices, coconut, sap or resin, cigar box or pencil shavings being referred to frequently. More heavily toasted barrels tend to impart notes of coffee ground, tar, caramel, cloves, smoke, spice and roasted nuts. A wood-saturated wine must have the capacity by way of its robust fruit and structural dimensions (e.g. tannins in reds, acid in white wines) to stand up to a complex regimen of newer oak barrels toasted to higher levels or the resulting wine will lose a significant degree of its identity. There is an increasing tendency for more value-oriented wines to be subjected to wood chips or staves introduced directly into wine vats. 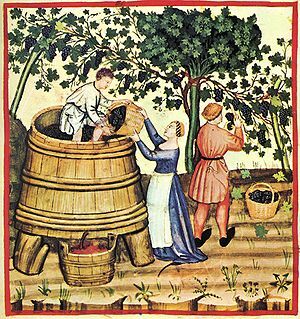 This practice can replicate the traditional barrel-crafted wine-making method to a certain degree yet it can result in a more aggressive oak character and astringent tannins. It also often fails to capture the benefits of the complexity that slow oxygen transfer or micro-oxygenation affords a wine fermented and/or aged in cask. With high culinary art, a masterfully-trained chef nurtures the finest ingredients into a whole, maintaining the integrity of every component yet rendering a dish that elevates each. The art of cooperage and its judicious incorporation into the wine-making process echoes this approach. Where oak is concerned, its precise, timely, nuanced application is meant to be deployed in the service of the primary voice of the grapes themselves. A heavy hand leaves an indelible stamp that will ultimately compromise both wine and winemaker. 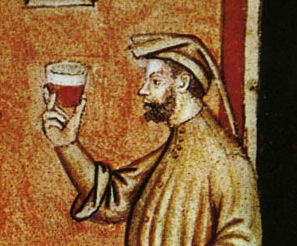 Going forward, it is possible that as you raise your glass to acknowledge talent, friendship, love or achievement, the wine you present in the tribute you make may now quite differently define your notion of what it means to toast. « The (Golden) State of Pinot Gris!